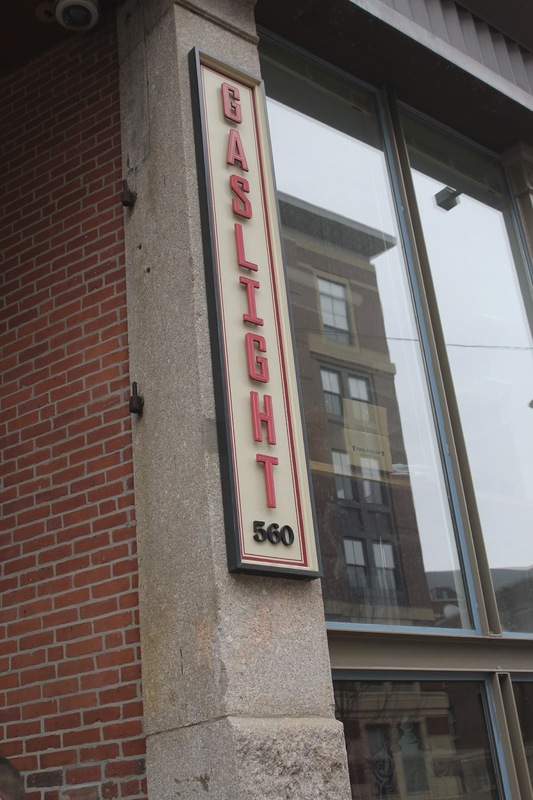 Our Saturday South End tour started at 3 p.m. at Gaslight Brasserie du Coin. This is a restaurant that's been on my must-go list for a long time, and I was shocked that this was the first time I was actually going there (though not to eat). My friend and I found seats at a high-top in the bar area amid the other tour-goers and soon met our wine ambassador, John Fiola. John became interested in wine years ago when he had to pick out a bottle to bring for Thanksgiving dinner and met a really knowledgeable, fabulous retailer who got him hooked. Since then he's taken numerous wine courses and now even teaches wine courses. His passion for wine was immediately evident. To break the ice a little, John had us go around the room and give our names, the first concert we ever went to, and the last glass of wine we had. It was fun learning these little tidbits about the group. Then we started in on the wine. Our first wine was a sparkling rose (Marquis de la Tour Brut Rose Sparkling Wine from the Loire Valley). John showed us how to open a champagne bottle without popping the cork, which was very anticlimactic but definitely keeps the wine in the bottle instead of letting it spill out all over the table or floor. John explained that tiny bubbles and a head on the pour are both marks of a good wine. This one had a nice bread/yeasty smell and a mouthwatering feel (which is actually caused by the acidity in the wine). It ended up being my favorite of the wines we tried on the tour, and I think it would be a perfect summer dinner wine. As we sipped our wine, Gaslight provided some light snacks to pair with it. There was a simple cherry tomato half with parsley, steak tartare in lemon juice on toast, and crabmeat with aioli. Our next wine was a white burgundy (2011 Vignerons Buxy, Bourgogne Blanc, Cote Chalonaise) with lemon, green apple, and grapefruit notes. John described it as medium-bodied with crisp acidity and chalky minerality. I actually found it a bit blah until I paired it with the crabmeat and aioli. The horseradish in the aioli really perked up its flavor. We learned a little about Gaslight from the general manager, who was incredibly animated, friendly, and funny -- and now I want to try the food there more than ever -- before moving on to our next destination. Our next stop was Cinquecento. Cinquecento is a relatively new restaurant from The Aquitaine Group, the same restaurant group that owns Gaslight. It is billed as a Roman trattoria, so I was excited to try some Italian wines. We all sat down in the bar area where we had great views of the unique space, and soon plates with apricot, salami, and Parmigiano-Reggiano were set before us. Our first wine here was one of my old favorites, a Gavi. (I first discovered Gavi at a wine shop in Norwalk, Conn., where I used to live before I moved to Boston nearly 7 years ago. I went through a phase of picking it up every time I needed a white.) This particular one (2011 La Scolca (Piedmont) Gavi di Gavi) goes well with seafood and tastes of lemon and other citrus. John pointed out a bit of earthiness and funk. The red was poured from one of Cinquecento's wine taps and was a Nero d'Avolo (Nero D'Avola (Sicily) Gotham Project tap wine), which is indigenous to Sicily. John informed us that it's meant to be drunk young, and that the drying sensation it leaves behind is due to its tannins. We wrapped up at Cinquecento and ventured on to our final destination: Masa. Here we all sat around one big table. Our first wine was a Chardonnay (2009 Silver Palm Chardonnay, North Coast California). I'm not usually a fan of Chardonnay, but this one was very fruity, and I actually liked it. While we enjoyed the wine, Masa sent out platters of their tapas. I appreciated the more substantial bites, but each platter featured just one of each type of tapas. My friend and I shared about four things off the plate, but we had to make sure the people around us got food too. It was a little disappointing not being able to try one of each item or worrying that we were taking something someone else wanted. It would have been better (and less awkward) if they focused on three or four tapas and sent full plates of each of those out or gave us individual plates of food as the other restaurants had done. That said, we really liked the bites we had, especially the mini fish taco. The last wine was a Spanish red (2009 Convey, Priorat DOCa, Spain 50% Grenache, 30% Carignan, 20% Syrah). John taught us to tip the wine toward the lip of the glass and then tip it back, watching the drips down the inside of the glass. These drips are called legs, and the more legs a wine has the more alcohol it has. After a brief informal question and answer session, the tour came to a close, and everyone went their separate ways. For the price of the tour and the touting of highlighting "Boston's nationally acclaimed culinary scene with stops at award-winning restaurants," I expected more food, but otherwise we had a really nice time on the tour and loved moving from restaurant to restaurant and trying some new wines. We also learned a ton from John and appreciated his passion and excitement for all things wine. This tour was complimentary, but my opinions are my own. Have you ever taken a wine tour? Read my next City Wine Tours post for a discount code good for $10 off tour tickets.